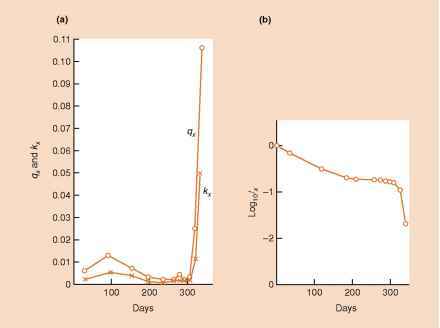 The relevance of biomechanical constraints to ecological speciation depends on the relationship between performance abilities (i.e., the potential to produce certain displays) and actual signaling behavior (i.e., displays as realized in nature). Performance is increasingly recognized as a critical link between morphology and behavior [77,146,147] but is rarely considered in the studies on production, development, and evolution of animal displays [e.g., 148,149]. We have argued here that as populations begin to diverge in adaptive traits, corresponding changes in biomechanical systems may influence the potential for animals to perform different kinds of displays. Such changes, however, will not necessarily cause immediate changes in the structure of mating displays. Correlated changes in performance abilities and displays are most likely to occur under two conditions [see 139]. First, signals in their initial state should be produced at or near some performance limitation. For example, particularly rapid and intricate aerial displays in a hummingbird may challenge baseline flight performance capacities. Such displays are likely to be favored by sexual selection because they can help females accurately assess variation in quality among males . Second, adaptive divergence (e.g., in morphological traits) would need to occur in directions that run counter to performance limits, e.g., by imposing phenotypic tradeoffs or by barring further evolutionary modifications. In our hummingbird example, adaptive evolution toward reduced body sizes and increased flight performance (e.g., under selection for stronger resource defense) should not detract from display performance abilities, whereas selection for large body size and thus against flight agility would immediately detract from display performance. Of course, the former case could still cause reproductive isolation if the population evolving higher performance capacities then performed correspondingly more intricate mating displays.